Dress for success by donning these discrete multi-tool collar stays. Pop it. Screw it. Cut it. Work it. Whether you need to pop a bottle or pop an errant seam, you'll always be prepared when you pop your collar with these Titanium Multi-Tool Collar Stays. Go from snappily dressed to ready in a snap when you stow these featherlight (0.4 oz), 100% titanium multi-functional tools in your shirt collar. 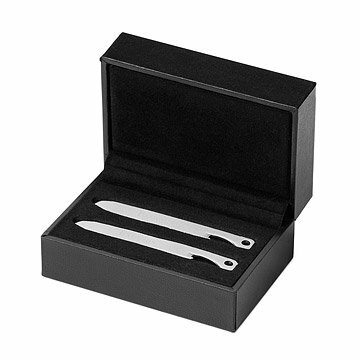 A great gift for dads and groomsmen, these sleek and discreet tools let gentlemen look dashing as they confidently tighten screws, slice threads and open bottles in a dash. These stays even feature a hole to keep safely on your key chain. Sold in a set of two (one pair). Made in China. 2.5" L x .31" W x .13" H, .4 oz. Integrated tools: half-phillips screwdriver, slotted screwdriver, thread cutter, bottle opener. They work just as they are supposed to. Are still very light, but not flimsy. Amazing gift idea. My husband has to wear suits to work everyday. These were a huge surprise and he was super stoked to see them. Great product and defienlthy a great gift for any guy who wears suits often. I got these for my boyfriend because he is a custom clothing salesman and wears a suit everyday. He was really excited to use these and loves the multi-functional use of them. I do wish they were a bit shorter as they don't fit all of his shirts. Novelty gift that he actually uses. Good quality. Gave as a gift and it was a hit! Unique and perfect for a guy that wears a suit daily for work. As another reviewer wrote, this is a clever way to make an otherwise boring gift fun. My husband always loses his stays so I thought this was a good way to get him to be a bit more mindful! Nice looking packaging too. This is a really fun twist on something that would otherwise be a kind of boring gift. My husband loves the idea that it was multi functional and can't wait to utilize the bottle opener capacity. Super fun gift idea for the professional male who has everything. Given as gift and very well received. Purchased and gave away two sets as Christmas gifts. Well received by both. Thought is was a pretty neat idea.